Moving to a new country at any time is difficult, but Jennifer Richardson had a tougher time than most. In addition to having a somewhat difficult marriage, she was also struggling with the question of whether or not to have children when she and her husband, "D", decided to move from the U.S. to his native England. Their experiences and problems are chronicled in the new book Americashire: A Field Guide to a Marriage. The couple first moves to a small flat in London, where they are dismayed at the noise and inconsideration of their neighbors. Since D had come into some money through an inheritance, they began looking for a "country home" where they could escape the bustle of London on the weekends. Soon they've purchased a cottage in the picturesque Cotswolds and begin to settle in to village life (at least on the weekends!). There are many things which are new to both of them: fairs and fêtes, hunt auctions, and the odd dress and behavior of those who are "toffs" (upper class folks, to you and me). After enjoying this split-week living arrangement for a while, the author has the chance to apply for a new job which would make living at the cottage full-time a possibility for her (although her husband would still only come down at weekends). She does get the job and so becomes a full-time country resident. Her husband, while initially supportive of the idea, becomes somewhat jealous of her situation. His frequent intermittent bouts with depression are a constant source of conflict with the couple. Additionally, she has to endure her parents' not-so-subtle hints that they are waiting for her to produce a grandchild, something she's not exactly eager to do. 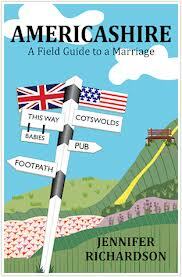 I really enjoyed reading about Jennifer's move to England and the Cotswolds. Although there were many struggles along the way, it sounds as if the time she and D spent there was interesting and that the culture shock was not too extreme! The book also includes four Field Guide walks to explore more of the area and which also include lots of helpful information, such as the location of handily located pubs and wine bars along the routes! Disclaimer: I received a copy of this book from the author in exchange for this review.